The distance between Australia and Sweden is almost 10,000 miles. The distance between Bullet and their closet influence and peer may be too close for comfort. There is only about one degree of separation between Sweden's Bullet and AC/DC. If imitation is the sincerest form of flattery, Angus and company would blush with a listen to Bullet's latest Bite the Bullet. Bullet is essentially as Swedish version of AC/DC. There I said it, again stating the obvious. Vocalist Hell Hofer is closer to Bon Scott era AC/DC than current more bluesy lead man Brian Johnson. 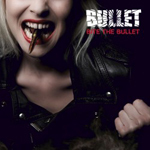 As for Bullet's sound there is no question about it's foundation: Bite the Bullet is filled with 11 tracks of well-crafted and trademark AC/DC boogie rock. Fortunately for us, Bullet does this style quite well making Bite the Bullet a good album for driving or your next keg party. In the end, I wonder if wouldn't be simply better to get out Highway to Hell or Back in Black, since the original is always better than the copy. But if you can't get enough of that AC/DC sound, then Bullet is probably one of the better bands doing it. Top tracks: Rock n Roll Remedy, Pay the Price, and Wheels Keep on Turning. Bullet is a Swedish version of AC/DC, plain and simple. Thankfully, Bite the Bullet's eleven original numbers are more homage than caricature.